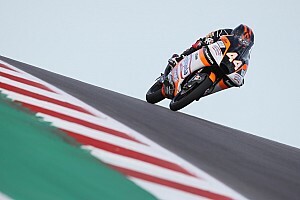 After topping Friday practice, Spanish rider Canet also set the pace in his first qualifying session with former MotoGP star Max Biaggi's new KTM squad, beating Leopard Honda rider Lorenzo Dalla Porta by 0.197 seconds at the end of a new-look session. Both Moto3 and Moto2 have switched to a MotoGP-style two-part qualifying format for the 2019 season, with the top 14 from practice securing automatic Q2 berths. The remaining 15 riders were left to fight it out in Q1 for four slots to join the pole shootout. Sky VR46 newcomer Celestino Vietti topped the opening session with a best lap of 2m06.689s, with John McPhee (Petronas SRT), Ai Ogura (Honda Team Asia) and Raul Fernandez (Angel Nieto) joining the Italian in making it through to Q2. First to dip underneath Vietti's benchmark in Q2 was Romano Fenati (Snipers Team) with a 2m06.681s, followed by teammate Tony Arbolino and Kaito Toba (Team Asia). Toba's benchmark stood for around a minute before it was bettered by Canet, who put himself a quarter of a second clear with a 2m05.883s with four minutes left on the clock. At the chequered flag, Dalla Porta grabbed second ahead of Toba, while Andrea Migno (Bester Capital Dubai) moved up to fourth ahead of McPhee and Niccolo Antonelli (SIC58). Albert Arenas (Nieto), Arbolino, Vietti and Vicente Perez (Avintia) completed the top 10. Fenati - back in Moto3 this year with his old Snipers outfit after losing his Moto2 ride last year - did not leave the pits in time to begin what should have been his final flying lap. 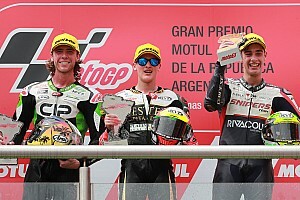 The Italian will start Sunday's season opener from 12th, one place ahead of Gresini's new rider Gabriel Rodrigo, who has recovered from breaking his right collarbone in testing. Last year's Valencia Moto3 winner Can Oncu (Ajo) will start his first race as a full-time rider in 18th after ending up slowest of all in Q2.